Your Death Valley adventure begins with a complimentary continental breakfast in Beatty, Nevada, your first stop in the Mojave Desert. See the impressive salt pan of Devil's Golf Course and the beautiful badlands landscape at Zabriskie Point. After enjoying some boxed lunch, continue to Ubehebe Crater. The crater is all that remains from a volcanic eruption so powerful that it destroyed the volcano itself. 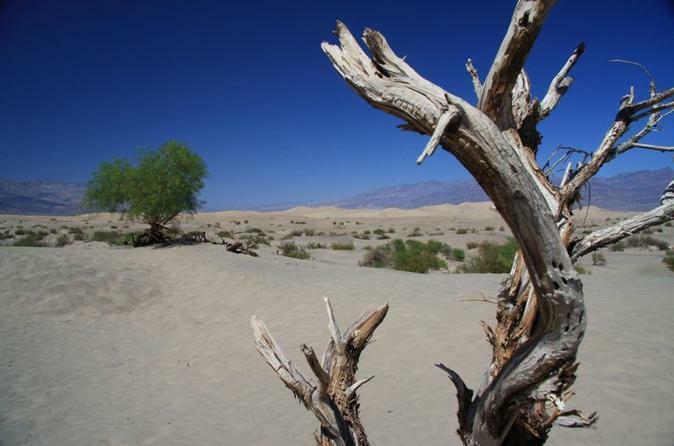 Then it's on to Furnace Creek Ranch Museum, where you can learn about the history of Death Valley. Stop next at Badwater, the lowest spot in North America, at 282 feet (85 meters) below sea level, with a permanent spring-fed pool where you actually can walk on the salt flats. Your final stop on the tour is at Rhyolite Ghost Town, before concluding at your original departure point.